← Ethiopia. In a remote Hammer’s village for an initiation rite. 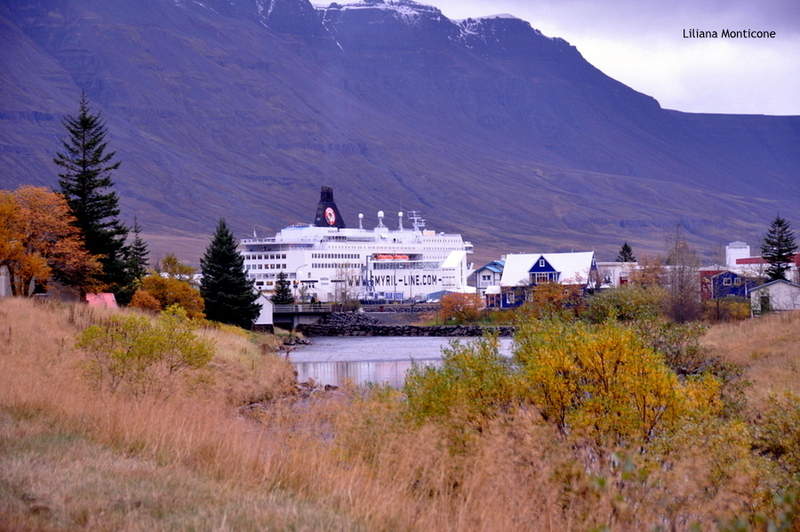 We arrive on board of Norrona Smyrilline at Seyðisfjörður in the east coast of the Iceland. It’s mid October. We couldn’t ignore the lowest cost offer to reach Iceland. The Norrona enter in one of the most beautiful fjords in Iceland at dawn, allowing us to enjoy this part of the island so different from the Reykjavik area and … finally – with a half hour delay for us, so eager to get off the ground that seems a long day, open the door! A quick check of the customs in a box covered and heated and go to our destination: the beautiful lagoon Jökursárlón at the foot of Vatnajökull glacier, the largest ice cap in the world, after Arctic and Greenland. It’s quite far from our dockage, about 350 km and by the way we cross the Sandur desert, the spectacular Icelandic desert of black sand, and we make a long circumnavigation of the fjords. Here in Iceland the distances aren’t calculated with our standards and our rhythms. The beautiful and warm sunny day today, so unusual for this season and these latitudes, makes our trip unique. Besides, what could be better than driving a jeep 4×4 in Iceland?? The first part of the route runs through the pass to get to the ring 1, between lakes and a bit of snow. The road is very scenic, but requires immediately a lot of attention! Then we pass through the desert barrens. The ring 1 hasn’t, in this section, several kilometers unsurfaced with a lot of steep switchbacks. You realize immediately that landed on another planet! But the meetings that you make, such as this group of reindeer, went down to the valley to get food, they are truly unique! Did you know that the reindeer aren’t endemic? Were imported from Norway with the aim of developing the farm, which has never really developed, so they were released and now populate the highest mountains. We then arrive at sea and now the ring 1, from here to lagoon, is entirely paved. Of course the guide is so much easier, but not fast. It revolves around a number of fjords, a more interesting one another and we find many farms scattered at a distance of tens of kilometers apart. Accustomed to our lives and our frenzy is inevitable to ask how they can live here all year round. Through these areas, especially on the way back, after darkness advances, it’s strange, even to us accustomed to the territories a bit extreme. But here is the nature to lord and the man is very little in this immensity of the territory. Hours and hours to driving without meeting anyone. Finally, around the corner, here is the lagoon, this spectacle of nature appears in all its magnificent! It’s a unusual place for this climate and these latitudes. The icebergs that break off from the front of the glacier go to the sea, instead of being dissolved by the water of the sea, thanks to a series of anomalous currents, are rejected towards the inside of the lagoon, where they roam placid for months, sometimes for years, creating this unique and indescribable landscape. Icebergs assume shapes and different colors. They are all beautiful and the sun gives light blue intense reflects. But the best of this lagoon are the seals that swim elegant in search of food that this lagoon is so rich. Valeria wastes no time and immediately takes possession of a mini-iceberg. I hope not thinking of using it to navigate to the seals! With her, everything is possible. They approach the shore curious. We look them and they look us. They seem very near. And the seals are really a lot. Some people sit scattered on the shore, in silence, in complete and total admiration of this scenario. But we aren’t allowed it, right Valeria? She isn’t stopped one minute. She must see everything, go anywhere, run anywhere, count all seals, … You can not just hold she. Or rather, we would like to sit still! You go where you want! You could also give me time to take a picture without you having already ahead to another destination towards which to run! The seals! Of course! But they don’t come out of the water to be touched by you! Another photo with our mini-iceberg, while a seal curiously approaching a little bit. I wonder what is it thinking! I must say that it is not the only one to be so happy … Roby, it’s true? Now we all understand why! The amphibious vehicle is fantastic! By this means you can navigate through the ice. The experience is not just economic, but the prices are not impossible. I assure you that if you are lucky enough to arrive here, you can not miss it! And so, in a short time, we are on board. See these formations browsing is even more beautiful. Although I must admit that these jackets are really uncomfortable! From what we are told on the tour, however, are of vital importance, they did wear even a baby who is with us … yes, even in this place a little extreme, in October, lucky there are those who aren’t afraid to travel with baby! It sometimes happens that the icebergs, without warning, suddenly tip over and the larger ones can cause serious problems if the amphibious vehicle is nearby. There is a guy with a small boat always precedes our way to try to avoid problems. On board the explanations provided us are very interesting. The ice of this lagoon is very pure and very transparent due to the external environment completely free of pollution. Except when the volcano’s explosion that block ground planes all over the Europe, spread throughout Iceland its black powder that is deposited on the iceberg dirtying it. These iceberg turn itself several times to “reorganize” the center of gravity and the play of colors and overlays that are created are unique. In addition it is possible to determine the age of the iceberg. Those transparent and perfectly white, like these, are recent and created after the eruption of the volcano. Ci è piaciuta l’esperienza? Io credo che il volto di Valeria in questa foto, davvero dire tutto! We don’t want to get away really. The two hours tour pass in no time at all. Also the afternoon passing quickly and we have so little time. Here too, the number of photos that we take is truly exaggerated. But every angle permit to grasp a panorama always new and different. And it’s time to move on. We cannot stay here … unfortunately! We cross the road and go to the beach black sand in front. This is the point at which the sea, rejects the icebergs that come back into the lagoon. But not all. Many melt just like that. Like this, on the black beach. And the scene with its contrast of light and color is a paradise for any photographer. Roby! This ice isn’t good for mojito! Sunset that reminds us that it is time to move inexorably and go on journey again. Even if we don’t want to leave this place, another adventure awaits us. Now we head north towards Lake Myvatn, where we should arrive tomorrow early in the morning. We can sleep in the car and change driving… but this is a story that I’ll tell you next time! This entry was posted in Europe, Iceland and tagged barca @en, iceberg @en, mezzo anfibio @en. Bookmark the permalink.